We are sitting atop rickety wooden benches in a cozy corner of a very small, very old pub. A fire roars to my left and I am enveloped in the laughter of my family. We dine on a variety of traditional pub fare, swilling beer and wine to warm ourselves as snow falls gently just beyond the stone-framed windows. We are in the tiny hamlet of Ford, a short drive on the other side of the road from Bath, England. Having unanimously elected to forgo our typical holiday traditions and gifts and to instead have an adventure together, my family escaped to England. Arriving on Christmas day, the next week was spent exploring London with a brief reprieve from the bustle of the city in Ford, at the White Hart. A small and impossibly quaint series of stone homes make up this pub and inn which is nearly hidden in the rolling hills of the English countryside. Upon review of our trip when the typical ‘what was your favorite part’ questions were queried, my Brother, Sister, Mother, Father and I all agreed that it was our short time at the White Hart that had left the most impactful impression. Besides the drinks and fire, what kept us content and warm on our snowy night at the Inn? Their homemade leek and potato soup. It was my first sampling of this classic combination, and I was blown away by how simplistic yet full the flavors were. There is something completely satisfying about a potato, a foodstuff so humble yet so beloved. And when blended with silky, lightly sweet leeks, you will find yourself most at home, no matter what the setting. 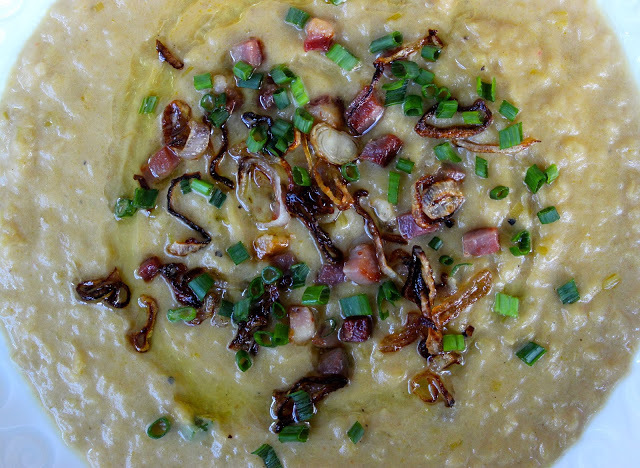 My take on this soup is finished with crispy-fried shallots, salty pancetta, refreshing chives and a drizzle of olive oil. A pass through the food mill leaves the texture of the soup complex and fulfilling. It took me back to the White Hart almost instantly. To that table with my family. To a place where nothing else mattered, except the laughter and love surrounding me. There is a relatively short lineup of ingredients for this recipe, with potatoes and leeks being the obvious and tasty focus. 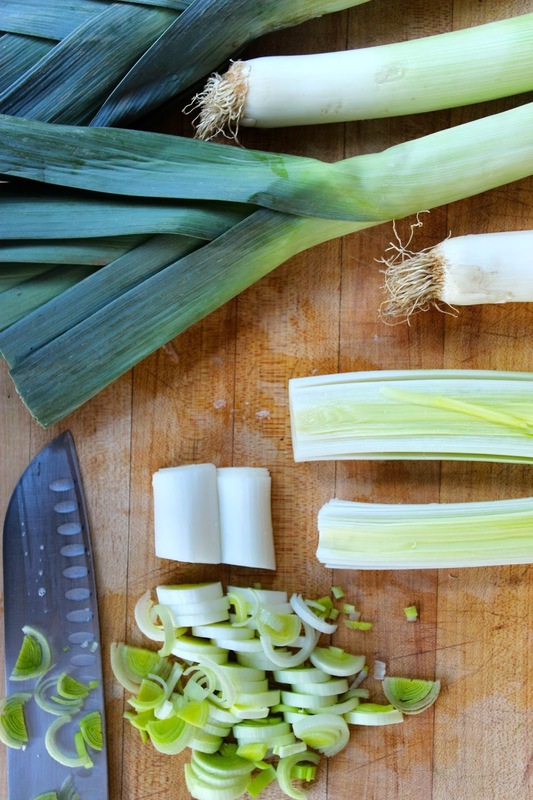 Clean and chop six leeks, removing the woody, green ends and slicing the onion lengthwise, running the thin layers under cold water, making sure any sand hiding in the folds is removed. Peel and chop four pounds of yukon gold potatoes into one-inch cubes. Potatoes and leeks alone don’t have a great amount of flavor so we need to help them out a bit. A bouquet garni of one bay leaf, one sprig of rosemary and four stems of thyme, a pinch of red pepper flakes (Foxhollow Farm has the BEST red pepper flakes – a staple in the foodie-girl pantry!) and a dose of freshly minced garlic will take the flavor profile into delicious territory. Melt six tbs of unsalted butter in a heavy bottom pot. Add the leeks along with one half tsp kosher salt and saute over medium heat for eight to ten minutes until the leeks are silky and soft. Add the potatoes, the bouquet garni, garlic, red pepper flakes, an additional tbs of kosher salt and six cups of unsalted vegetable stock. Stir to combine and bring to a boil. Cover the pot and allow the soup to boil for ten to fifteen minutes, until the potatoes are tender and can be easily pierced with a fork. There are several different ways you can take the next step but I highly encourage you to invest in a food mill. With a set of course blades, a food mill allows you to gently puree food while keeping a sense of texture in place. Set the mill over a large bowl and carefully ladle the soup into the bowl of the mill, turning the handle to churn the potatoes and leeks through the course blade, reversing the turn of the handle to clean the blade intermittently. No food mill? Not to worry, a blender or a food processor will do the trick as well. Once all of the soup has gone through the food mill, return it to the pot and stir well, turning the flame to medium heat. Add one cup of heavy cream, an additional one half tsp kosher salt and one quarter tsp freshly ground black pepper. Bring to a low simmer, stirring frequently. While the soup is simmering prep the garnishes. Warm a small sauté pan over medium heat and add one tsp olive oil. Crisp one quarter cup diced pancetta – approximately two ounces – for five minutes and remove to a plate lined with a paper towel. Add an additional tsp of olive oil to the pan and then one thinly sliced shallot, sautéing until crisp. Keep a very close eye as these delicate onions can be quick to burn. Carefully remove to a separate paper towel to drain. Ladle the soup into bowls, drizzle with olive oil and top with the pancetta, shallots and freshly diced chives. Serve immediately and enjoy! Clean and chop six leeks, removing the woody, green ends and slicing the onion lengthwise, running the thin layers under cold water, making sure any sand hiding in the folds is removed. Peel and chop four pounds of yukon gold potatoes into one-inch cubes. Melt six tbs of unsalted butter in a heavy bottom pot. Add the leeks along with one half tsp kosher salt and saute over medium heat for eight to ten minutes until the leeks are silky and soft. Add the potatoes, the bouquet garni (one bay leaf, one sprig rosemary and four sprigs fresh thyme tied together with kitchen twine), garlic, red pepper flakes, an additional tbs of kosher salt and six cups of unsalted vegetable stock. Stir to combine and bring to a boil. Cover the pot and allow the soup to boil for ten to fifteen minutes, until the potatoes are tender and can be easily pierced with a fork. There are several different ways you can take the next step but I highly encourage you to invest in a food mill. With a set of course blades, a food mill allows you to gently puree food while keeping a sense of texture in place. Set the mill over a large bowl and carefully ladle the soup into the bowl of the mill, turning the handle to churn the potatoes and leeks through the course blade, reversing the turn of the handle to clean the blade intermittently. No food mill? Not to worry, a blender or a food processor will do the trick as well. Once all of the soup has gone through the food mill, return it to the pot and stir well, turning the flame to medium heat. Add one cup of heavy cream, an additional one half tsp kosher salt and one quarter tsp freshly ground black pepper. Bring to a low simmer, stirring frequently. This looks delicious! Can't wait to make it this winter!